ORO by MAHGUL set to exhibit luxury prêt-à-porter,ready to wear cottons and bespoke lawn prints! [Lahore: 04 May 2016]: Following the critically acclaimed debut of ORO at the PFDC Sunsilk Fashion Week with The Indus Society Collection and a successful exhibition at Ensemble Karachi in April, MAHGUL is set to exhibit their brand new line of accessible luxury, pret and formal wear, ORO, in Lahore on Saturday the 7th of May 2016 at The Mahgul Studio, 7-B, Block F, Gulberg 2 from 11 AM – 8 PM. In addition to exhibiting the entire Indus Society collection for order, the one day exhibition will also present a ready to wear retail version of the bespoke prints from the same collection along with a diversity of semi-formal Eastern and Western wear to retail and order. ORO by MAHGUL will also showcase their signature line of summer cottons and introduce a new line of boutique, limited edition lawn prints. “The introduction of our brand ORO is a new design chapter, to produce seasonal and mid-season collections that are more accessible, available and wearable, but always with our signature edge. 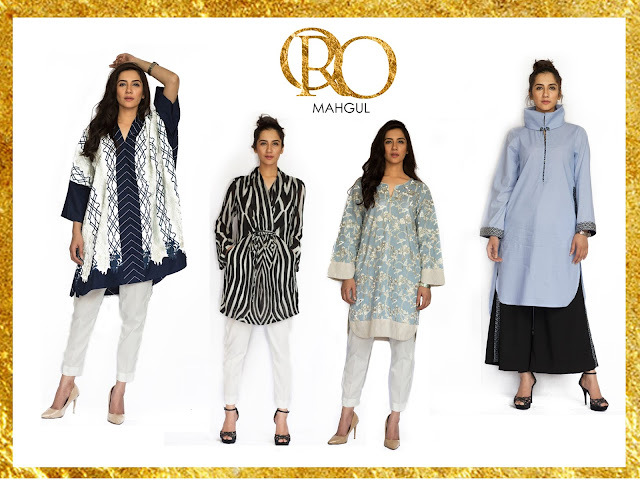 With our first exhibition, we aim to bring diversity across a series of capsule collections: from Western luxury to Eastern formal to everyday summer wear”said Mahgul Rashid, creative director at her eponymous brand. ORO by MAHGUL will soon be exhibited in Islamabad. The collection looks trendy yet comfy. Thanks for sharing.